The history of gnomes being used in gardens is longer than you might think. The tradition originated in the 1800s, and those original garden gnomes are far different than the plastic or plaster gnomes we know today. Gnomes are a cute addition to the garden and also a good-luck charm. The first known garden gnomes were produced in Germany in the early 1800s. They were made out of clay. Gnomes first appeared in gardens in England in the 1840s, and from there their popularity began to take off. The first garden gnomes that were mass-produced also came from Germany in the 1870s. The two big names in gnome manufacturing were Philipp Griebel and August Heissner, with Heissner becoming known around the world for his gnomes. Unfortunately, the world wars wiped out most garden gnome production in Germany, and beginning in the 1960s, the plastic gnomes we know today came on the scene. These gnomes are campy and cartoonish, and many people don’t like them. In the 1980s, companies in the Czech Republic and Poland started to make gnomes and flooded the market with cheaper imitations of the German products. The American company, Kimmel Gnomes, is one of the few manufacturers of clay and resin gnomes that are finished by hand and not mass-produced. People who want a gnome with some soul seek out these, which come in a variety of sizes and poses. 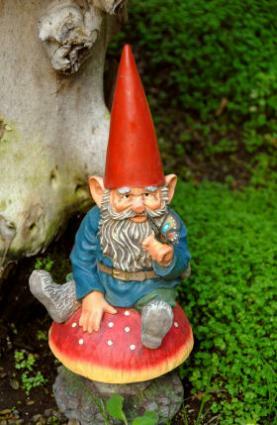 The history of gnomes also passes along the folklore and why you would want one in your garden. Gnomes are known as symbols of good luck. Originally, gnomes were thought to provide protection, especially of buried treasure and minerals in the ground. They are still used today to watch over crops and livestock, often tucked into the rafters of a barn or placed in the garden. A garden gnome adds a bit of whimsy and a connection to the old world, where farmers believed the good luck charm could help their fields yield more produce and protect them from thieves, pests and other problems. They were also thought to help gardeners in the night, which we all could use! The mythical gnomes in history were thought to live underground, and their name is thought to derive from a Latin word for earth dweller. They were popular in German fairy tales and were often described as old men who guarded treasure. However, gnomes or similar creatures were also found in folklore from many different countries, where they went by different names such as Nisse in Denmark and Norway, Duende in Spain and Hob in England. Gnomes generally were not described thoroughly in the stories, but garden gnomes produced throughout the world have the same general look, usually with a long, white beard, a red hat and simple clothes. The female gnomes tend to have long hair, the same hat and a simple dress, and look somewhat like witches. These days gnomes can be found in all sorts of different costumes and configurations, adding to the distaste felt by many who don’t like these creatures. There are gnomes with kegs of beer, built in solar lighting, skiing gnomes, gnomes taking baths, and gnomes mooning onlookers. While these are much different from the traditional intent of gnomes in the garden, if they give you a laugh they are serving their purpose and are a lot more fun than conventional garden statues. Clear Air Gardening has a good basic selection of gnomes. Garden Gnomes Need Homes has gnomes that are slightly higher quality. Gnome Town USA has gnomes in several sizes. Zwergli Gnomes has handmade German gnomes. Kimmel Gnomes offers classically made gnomes from America. No matter where you shop for your garden gnome, know that you are following a rich history of people who have used gnomes for decoration, protection and to bring a bit of whimsy into the garden.